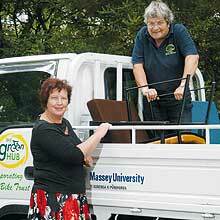 Palmerston North’s campus-sited Green Bike Trust is branching out into new endeavours. Bryan Gibson and Malcolm Wood write. Marsh of the Green Bike Trust. production of the Sound of Music. placement, they are not in showroom condition. defined category of retro classics. refurbished more than 7000 bicycles. Old furniture arriving at the Green Hub for recycling. Kyleisha Foote has a problem. The workings of her trusty mountain bike have failed on the way to a lecture, putting the brakes on her daily ride to Massey University. Stuck at class with a broken bike, the 23-year old geography student decides to take advantage of a campus-based workshop. She walks it up the drive to what was formerly the Palmerston North campus boiler room building, which now houses Palmerston North’s Green Bike Trust. It is fixed in no time, for a very student-friendly price, at Massey’s ‘department of cycleology’. 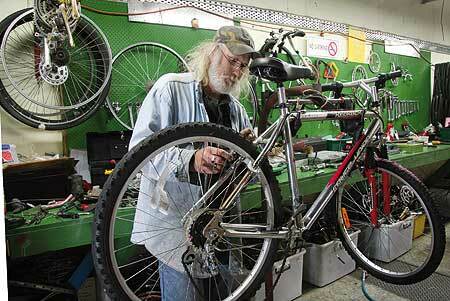 As well as carrying out repairs, the trust provides bikes to people wanting a cheap and carbon-neutral way to get around the city. For a $20 deposit, people can ride away on one of the hundreds of ten-speeds, mountain bikes and restored relics housed at the facility. 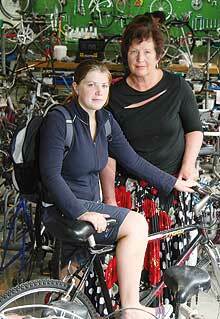 Over the years, Green Bike Trust programme manager Yvonne Marsh has seen many a bike make the same journey. Around 20 will leave today, perhaps a 100 over the course of February, which is a relatively quiet month. Liberated into the community – so the idea runs – the bikes will save fuel, cut carbon emissions, encourage physical activity, and make their new custodians’ lives easier. Back in the cavernous post-industrial space of the boiler room building, the bikes stand in ranks, their chrome handlebars catching the early morning sunlight that pours in through a wall of dusty windows. They are a motley lot: no two are the same, but they are mechanically sound – each goes through a rigorous inspection before being declared roadworthy. Alongside the racks of bikes is the workshop, its floor neatly swept and every tool in its place. Here the bikes are either rebuilt or – for many parts are now unavailable – cannibalised, and student bikes are repaired at subsidised prices. Then there are the people. Outside on the forecourt a man with long grey hair furiously pedals away on a bike that is much too small for him, looking like a character from a surrealist film. On the stairs up to the small office we are smilingly greeted by a young man who is obviously awaiting instruction. From a recycled office chair, a mechanic enters inventory details. Today the Green Bike Trust is in the process of securing its future by integrating into a broader and more ambitious enterprise. This is the Green Hub, a provisionally named and so-far informally constituted umbrella organisation. Like the bike trust, which was one of its instigators, the Hub is being set up to pursue social and environmental objectives and be financially viable, but it will have the advantage of a much wider remit. Working in close collaboration with Ken McEwan of Massey’s Regional Facilities Management, it is the Hub that runs the local recycling service, using a small truck to collect the contents of 98 recycling bins at 28 locations around Massey’s Manawatu campus and the adjacent Crown Research Institutes. It operates a USEPA-approved fluorescent light bulb crusher, which fills 44 gallon sealed drums with the mercury containing waste for shipment and recycling. It stores recycled furniture over the summer months, passing it on to students at flea market prices when they return for the academic year. And it partners with a PC recycling business – which also has floor space in the boiler room – in running Palmerston North’s electronic waste collection eDay. It has even recently entrepreneurially explored the idea of not only contracting a glass cleaning service to the city council but also creating the technology with which to do it (see Bottle Drive p24). Each business stream brings in income in the form of contracts, subsidies, grants and payments. The bin of scrap metal now at the front of the boiler house, for example, will bring in $30 these days – well down on the $100 of a few months ago, but not to be scorned. 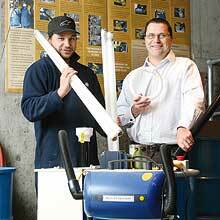 This is where the Hub will have its future: running a conglomerate of complementary niche environmental services. Eventually, if its instigators have their way, the Hub will be part of a number of wider hands-on environmental collaborations with Massey and Palmerston North. They would like to see it play a role in everything from the introduction of campus organic recycling and community gardens through to the establishment of a state-of-the-art resource recovery and recycling centre for Palmerston North. 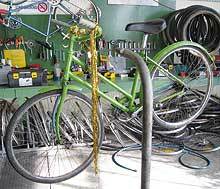 In the meantime the Green Bike Trust will continue to go about its business, improving the lives of a good part of Palmerston North’s population. Back in the early years the extent to which the green bikes had become part of the city’s life was more obvious. The bikes, being painted bright green, announced their presence.